Published: March 11, 2013 at 02:07 p.m. Updated: March 11, 2013 at 07:28 p.m.
Coach Pete Carroll and general manager John Schneider have been nothing if not bold since arriving in Seattle three years ago to re-make the Seahawks. They think different. They build different. They aren't afraid to take chances. On Monday, they made one of their boldest moves yet in acquiring Percy Harvin from the Minnesota Vikings in exchange for this year's first-round pick, a seventh-round pick, and a mid-round pick in 2014, according to Fox Sports insider and NFL Network contributor Jay Glazer. Harvin is a gamble because of the resources Seattle traded. The Seahawks are an organization built on great draft picks, and now they will have fewer turns at the podium. Harvin also will cost No. 1 wide receiver money to retain long-term. Sidney Rice, who is due $8.5 million in each of the next two seasons, also makes No. 1 wide receiver money. Don't expect Rice to be released this offseason, but his status is year-to-year at this point. It's hard to pay so much money at that position. » What's next for Vikings after trade? 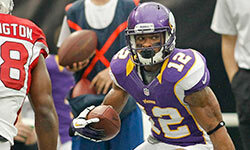 The trade is less of a gamble because of Harvin's reported troubles with the Vikings' coaching staff. No one has ever questioned Harvin's toughness, work ethic and desire to win. You can work with a guy like that. Ultimately, this is a gamble that should pay off for Seattle. The Seahawks recognize that their passing game needed to develop even further in 2013. They needed more weapons for Wilson. With Harvin, Rice and Golden Tate, the Seahawks will be extremely difficult to prepare for. Wilson already is such a unique quarterback to game plan against, adding Harvin just gives Seahawks offensive coordinator Darrell Bevell an endless array of options. The Seahawks have proven expert at finding roles for players on both sides of the ball and accentuating what those players do well. Harvin does a lot of things very well. Based on their track record, I expect the Seahawks to know just how to use him. Outside of trading for Darrelle Revis, acquiring Harvin was the biggest, boldest move the Seahawks possibly could have made this offseason. No one saw it coming. That's just Pete Carroll's style.